Ah winter, we meet again.... this week there's been a sudden drop in temperature in the UK and it's finally starting to feel a little festive. Of course I love summer too, but there are plenty of reasons why I enjoy winter just as much! Firstly, Christmas truly is the most wonderful time of the year; markets, mulled wine, pretty lights, board games, friends, family, presents, (and let's not forget to mention the John Lewis ads).... what's not to like!? There's also that delightfully refreshing smell/taste/feel of a cold winter's morning, and SNOW! The excitement of snow is embedded into our brains at a young age in England, and I don't think that ever goes away.... grown men still lie in bed at night in the midst of winter wishing for a 'snow day'! But most importantly, with crisp winter mornings comes knitwear, oversized jackets and ankle boots. Autumn/winter fashion is my favourite and I'm determined to treat myself to a new coat this year; I love the tie waist design of the three Cos styles above, and I'd really like a below the knee length. I've been doing a bit of research into other high street brands to see what's available as my budget is on the small side, but it's so hard to beat Cos's style, craftsmanship and elegance. 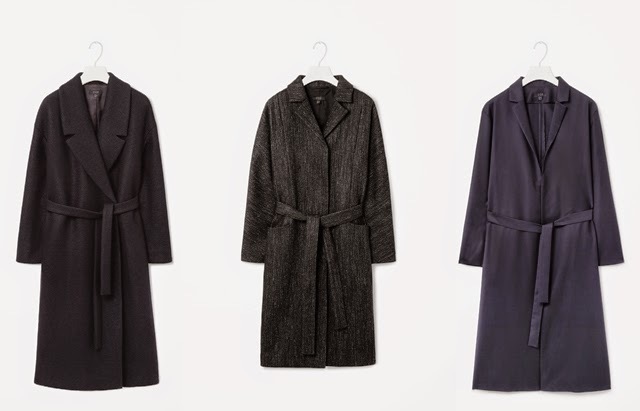 ASOS do actually have an amazing range of coats; I love the simplicity and colour of this boiled wool style above, (though The Whitepepper do have a very similar design for £15.00 less FYI). 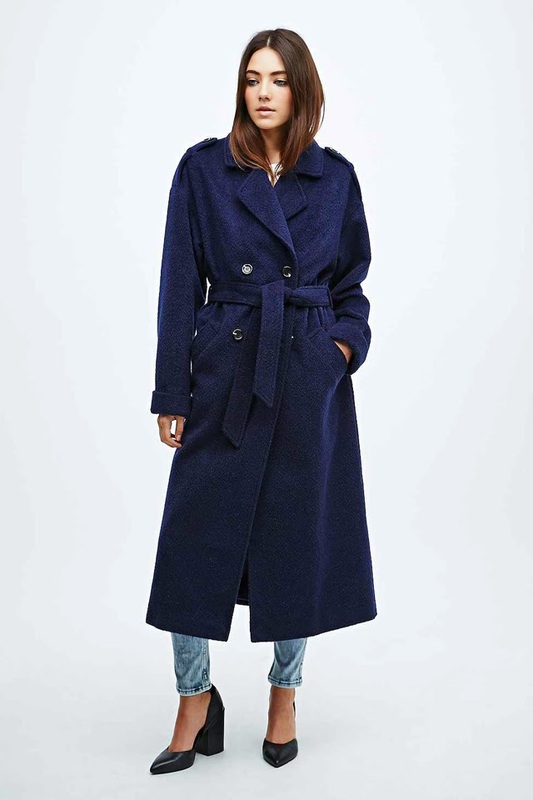 I also really like this Duster Coat by ASOS shown below, which is only £60.00 - I'm not sure how warm it would be but you could easily layer it up with a cardigan underneath and a big scarf and still achieve that gorgeous long, slouchy silhouette. I'd love to wear it with a pair of white Adidas Stan Smiths or alternatively my DM shoes would work just fine. Surprisingly Topshop didn't have much to offer apart from this amazing Blanket Coat by Topshop Unique, which is a beautiful colour but sadly out of my price range. I did come across this gorgeous trench from Urban Outfitters shown below, which is cheaper but I don't like the epaulettes on the shoulders. Also for that price I may as well just go to Cos! I think I'm going to hold off for a while and treat myself in December - I can't see much that I like online but I'd like to pop into Zara, Warehouse and & Other Stories for a browse too! What sort of coat or jacket will you be wearing this winter?